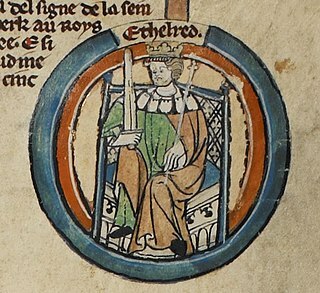 Edward the Elder (c. 874 – 17 July 924) was King of the Anglo-Saxons from 899 until his death. He was the elder son of Alfred the Great and his wife Ealhswith. When Edward succeeded to the throne, he had to defeat a challenge from his cousin Æthelwold, who had a strong claim to the throne as the son of Alfred's elder brother and predecessor, Æthelred. Alfred had succeeded Æthelred as king of Wessex in 871, and almost faced defeat against the Danish Vikings until his decisive victory at the Battle of Edington in 878. After the battle, the Vikings still ruled Northumbria, East Anglia and eastern Mercia, leaving only Wessex and western Mercia under Anglo-Saxon control. In the early 880s Æthelred, Lord of the Mercians, the ruler of western Mercia, accepted Alfred's lordship and married his daughter Æthelflæd, and around 886 Alfred adopted the new title King of the Anglo-Saxons as the ruler of all Anglo-Saxons not subject to Danish rule. In 910 a Mercian and West Saxon army inflicted a decisive defeat on an invading Northumbrian army, ending the threat from the northern Vikings. In the 910s, Edward conquered Viking-ruled southern England in partnership with his sister Æthelflæd, who had succeeded as Lady of the Mercians following the death of her husband in 911. Historians dispute how far Mercia was dominated by Wessex during this period, and after Æthelflæd's death in June 918, her daughter Ælfwynn, briefly became second Lady of the Mercians, but in December Edward took her into Wessex and imposed direct rule on Mercia. By the end of the 910s he ruled Wessex, Mercia and East Anglia, and only Northumbria remained under Viking rule. In 924 he faced a Mercian and Welsh revolt at Chester, and after putting it down he died at Farndon in Cheshire on 17 July 924. He was succeeded by his eldest son Æthelstan. Edward was admired by medieval chroniclers, and in the view of William of Malmesbury, he was "much inferior to his father in the cultivation of letters" but "incomparably more glorious in the power of his rule". He was largely ignored by modern historians until the 1990s, and Nick Higham described him as "perhaps the most neglected of English kings", partly because few primary sources for his reign survive. His reputation rose in the late twentieth century and he is now seen as destroying the power of the Vikings in southern England while laying the foundations for a south-centred united English kingdom. Mercia was the dominant kingdom in southern England in the eighth century and maintained its position until it suffered a decisive defeat by Wessex at the Battle of Ellandun in 825. Thereafter the two kingdoms became allies, which was to be an important factor in English resistance to the Vikings. In 865 the Danish Viking Great Heathen Army landed in East Anglia and used this as a starting point for an invasion. The East Anglians were forced to pay off the Vikings, who invaded Northumbria the following year. They appointed a puppet king in 867, and then moved on Mercia, where they spent the winter of 867–868. King Burgred of Mercia was joined by King Æthelred of Wessex and his brother, the future King Alfred, for a combined attack on the Vikings, who refused an engagement; in the end the Mercians bought peace with them. The following year, the Danes conquered East Anglia, and in 874 they expelled King Burgred and, with their support, Ceolwulf became the last King of Mercia. In 877 the Vikings partitioned Mercia, taking the eastern regions for themselves and allowing Ceolwulf to keep the western ones. In early 878 they invaded Wessex, and many West Saxons submitted to them. Alfred, who was now king, was reduced to a remote base in the Isle of Athelney in Somerset, but the situation was transformed when he won a decisive victory at the Battle of Edington. He was thus able to prevent the Vikings from taking Wessex and western Mercia, although they still occupied Northumbria, East Anglia and eastern Mercia. Edward's parents, Alfred and Ealhswith, married in 868. Her father was Æthelred Mucel, Ealdorman of the Gaini, and her mother, Eadburh, was a member of the Mercian royal family. Alfred and Ealhswith had five children who survived childhood. The oldest was Æthelflæd, who married Æthelred, Lord of the Mercians, and ruled as Lady of the Mercians after his death. Edward was next, and the second daughter, Æthelgifu, became abbess of Shaftesbury. The third daughter, Ælfthryth, married Baldwin, Count of Flanders, and the younger son, Æthelweard, was given a scholarly education, including learning Latin. This would usually suggest that he was intended for the church, but it is unlikely in Æthelweard's case as he later had sons. There were also an unknown number of children who died young. Neither part of Edward's name, which means 'protector of wealth', had been used previously by the West Saxon royal house, and Barbara Yorke suggests that he may have been named after his maternal grandmother Eadburh, reflecting the West Saxon policy of strengthening links with Mercia. Historians estimate that Edward was probably born in the mid-870s. His eldest sister, Æthelflæd, was probably born about a year after her parents' marriage, and Edward was brought up with his youngest sister, Ælfthryth; Yorke argues that he was therefore probably nearer in age to Ælfthryth than Æthelflæd. Edward led troops in battle in 893, and must have been of marriageable age in that year as his oldest son Æthelstan was born about 894. According to Asser in his Life of King Alfred, Edward and Ælfthryth were educated at court by male and female tutors, and read ecclesiastical and secular works in English, such as the Psalms and Old English poems. They were taught the courtly qualities of gentleness and humility, and Asser wrote that they were obedient to their father and friendly to visitors. This is the only known case of an Anglo-Saxon prince and princess receiving the same upbringing. As a son of a king, Edward was an ætheling, a prince of the royal house who was eligible for kingship. Even though he had the advantage of being the eldest son of the reigning king, his accession was not assured as he had cousins who had a strong claim to the throne. Æthelhelm and Æthelwold were sons of Æthelred, Alfred's older brother and predecessor as king, but they had been passed over because they were infants when their father died. Asser gives more information about Edward's childhood and youth than is known about other Anglo-Saxon princes, providing details about the training of a prince in a period of Carolingian influence, and Yorke suggest that we may know so much due to Alfred's efforts to portray his son as the most throneworthy ætheling. 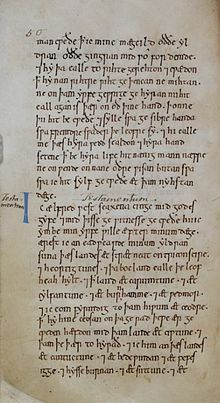 Æthelhelm is only recorded in Alfred's will of the mid-880s, and probably died at some time in the next decade, but Æthelwold is listed above Edward in the only charter where he appears, probably indicating a higher status. Æthelwold may also have had an advantage because his mother Wulfthryth witnessed a charter as queen, whereas Edward's mother Ealhswith never had a higher status than king's wife. However, Alfred was in a position to give his own son considerable advantages. In his will, he only left a handful of estates to his brother's sons, and the bulk of his property to Edward, including all his booklands (land vested in a charter which could be alienated by the holder, as opposed to folkland, which had to pass to heirs of the body) in Kent. Alfred also advanced men who could be depended on to support his plans for his succession, such as his brother-in-law, a Mercian ealdorman called Æthelwulf, and his son-in-law Æthelred. Edward witnessed several of his father's charters, and often accompanied him on royal peregrinations. In a Kentish charter of 898 Edward witnessed as rex Saxonum, suggesting that Alfred may have followed the strategy adopted by his grandfather Egbert of strengthening his son's claim to succeed to the West Saxon throne by making him sub-king of Kent. Once Edward grew up, Alfred was able to give him military commands and experience in royal administration. The English defeated renewed Viking attacks in 893 to 896, and in Richard Abels' view, the glory belonged to Æthelred and Edward rather than Alfred himself. In 893 Edward defeated the Vikings in the Battle of Farnham, although he was unable to follow up his victory as his troops' period of service had expired and he had to release them. The situation was saved by the arrival of troops from London led by Æthelred. Yorke argues that although Alfred packed the witan with members whose interests lay in the continuation of Alfred's line, that may not have been sufficient to ensure Edward's accession if he had not displayed his fitness for kingship. In about 893, Edward probably married Ecgwynn, who bore him two children, the future King Æthelstan and a daughter who married Sitric Cáech, a Viking King of York. 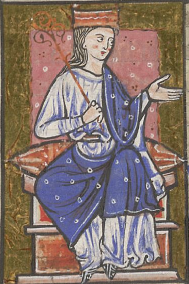 The twelfth-century chronicler William of Malmesbury described Ecgwynn as an illustris femina (noble lady), and stated that Edward chose Æthelstan as his heir as king. She may have been related to St Dunstan, the aristocratic tenth-century Archbishop of Canterbury. But William also stated that Æthelstan's accession in 924 was opposed by a nobleman who claimed that his mother was a concubine of low birth. The suggestion that Ecgwynn was Edward's mistress is accepted by some historians such as Simon Keynes and Richard Abels, but Yorke and Æthelstan's biographer, Sarah Foot, disagree, arguing that the allegations should be seen in the context of the disputed succession in 924, and were not an issue in the 890s. Ecgwynn probably died by 899, as around the time of Alfred's death Edward married Ælfflæd, the daughter of Ealdorman Æthelhelm, probably of Wiltshire. Janet Nelson suggests that there was conflict between Alfred and Edward in the 890s. She points out that the contemporary Anglo-Saxon Chronicle, produced under court auspices in the 890s, does not mention Edward's military successes. These are only known from the late tenth century chronicle of Æthelweard, such as his account of the Battle of Farnham, in which in Nelson's view "Edward's military prowess, and popularity with a following of young warriors, are highlighted". Towards the end of his life Alfred invested his young grandson Æthelstan in a ceremony which historians see as designation as eventual successor to the kingship. Nelson argues that while this may have been proposed by Edward to support the accession of his own son, on the other hand it may have been intended by Alfred as part of a scheme to divide the kingdom between his son and grandson. Æthelstan was sent to be brought up in Mercia by Æthelflæd and Æthelred, but it is not known whether this was Alfred's idea or Edward's. Alfred's wife Ealhswith was ignored in the Anglo-Saxon Chronicle in her husband's lifetime, but emerged from obscurity when her son acceded. This may be because she supported her son against her husband. 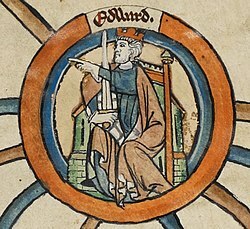 In 901, Æthelwold came with a fleet to Essex, and the following year he persuaded the East Anglian Danes to invade English Mercia and northern Wessex, where his army looted and then returned home. Edward retaliated by ravaging East Anglia, but when he retreated the men of Kent disobeyed the order to retire, and were intercepted by the Danish army. The two sides met at the Battle of the Holme (perhaps Holme in Huntingdonshire) on 13 December 902. According to the Anglo-Saxon Chronicle, the Danes "kept the place of slaughter", meaning that they won the battle, but they suffered heavy losses, including Æthelwold and a King Eohric, possibly of the East Anglian Danes. Kentish losses included Sigehelm, ealdorman of Kent and father of Edward's third wife, Eadgifu. Æthelwold's death ended the threat to Edward's throne. In London in 886 Alfred had received the formal submission of "all the English people that were not under subjection to the Danes", and thereafter he adopted the title Anglorum Saxonum rex (King of the Anglo-Saxons), which is used in his later charters and all but two of Edward's. This is seen by Keynes as "the invention of a wholly new and distinctive polity", covering both West Saxons and Mercians, which was inherited by Edward with the support of Mercians at the West Saxon court, of whom the most important was Plegmund, Archbishop of Canterbury. In 903 Edward issued several charters concerning land in Mercia. Three of them are witnessed by the Mercian leaders and their daughter Ælfwynn, and they all contain a statement that Æthelred and Æthelflæd "then held rulership and power over the race of the Mercians, under the aforesaid king". Other charters were issued by the Mercian leaders which did not contain any acknowledgment of Edward's authority, but they did not issue their own coinage. This view of Edward's status is accepted by Martin Ryan, who states that Æthelred and Æthelflæd had "a considerable but ultimately subordinate share of royal authority" in English Mercia. Other historians disagree. Pauline Stafford describes Æthelflæd as "the last Mercian queen", while in Charles Insley's view Mercia kept its independence until Æthelflæd's death in 918. Michael Davidson contrasts the 903 charters with one of 901 in which the Mercian rulers were "by grace of God, holding, governing and defending the monarchy of the Mercians". Davidson comments that "the evidence for Mercian subordination is decidedly mixed. Ultimately, the ideology of the 'Kingdom of the Anglo-Saxons' may have been less successful in achieving the absorption of Mercia and more something which I would see as a murky political coup." The Anglo-Saxon Chronicle was compiled at the West Saxon court from the 890s, and the entries for the late ninth and early tenth centuries are seen by historians as reflecting the West Saxon viewpoint; Davidson observes that "Alfred and Edward possessed skilled 'spin doctors'". Some versions of the Chronicle incorporate part of a lost Mercian Register, which gives a Mercian perspective and details of Æthelflæd's campaign against the Vikings. In the late ninth and early tenth centuries, connection by marriage with the West Saxon royal house was seen as prestigious by continental rulers. In the mid-890s Alfred had married his daughter Ælfthryth to Baldwin II of Flanders, and in 919 Edward married his daughter Eadgifu to Charles the Simple, King of West Francia. In 925, after Edward's death, another daughter Eadgyth married Otto, the future King of Germany and (after Eadgyth's death) Holy Roman Emperor. No battles are recorded between the Anglo-Saxons and the Danish Vikings for several years after the Battle of the Holme, but in 906 Edward agreed peace with the East Anglian and Northumbrian Danes, suggesting that there had been conflict. According to one version of the Anglo-Saxon Chronicle he made peace "of necessity", which implies that he was forced to buy them off. He encouraged Englishmen to purchase land in Danish territory, and two charters survive relating to estates in Bedfordshire and Derbyshire. In 909 Edward sent a combined West Saxon and Mercian army which harassed the Northumbrian Danes, and seized the bones of the Northumbrian royal saint Oswald from Bardney Abbey in Lincolnshire. Oswald was translated to a new Mercian minster established by Æthelred and Æthelflæd in Gloucester and the Danes were compelled to accept peace on Edward's terms. In the following year, the Northumbrian Danes retaliated by raiding Mercia, but on their way home they were met by a combined Mercian and West Saxon army at the Battle of Tettenhall, where the Vikings suffered a disastrous defeat. After that, the Northumbrian Danes never ventured south of the River Humber, and Edward and his Mercian allies were able to concentrate on conquering the southern Danelaw in East Anglia and the Five Boroughs of Viking east Mercia: Derby, Leicester, Lincoln, Nottingham and Stamford. In 911 Æthelred, Lord of the Mercians, died, and Edward took control of the Mercian lands around London and Oxford. Æthelred was succeeded as ruler by his widow Æthelflæd as Lady of the Mercians, and she had probably been acting as ruler for several years as Æthelred seems to have been incapacitated in later life. Edward and Æthelflæd then began the construction of fortresses to guard against Viking attacks and protect territory captured from them. In November 911, he constructed a fort on the north bank of the River Lea at Hertford to guard against attack by the Danes of Bedford and Cambridge. In 912, he marched with his army to Maldon in Essex, and ordered the building of a fort at Witham and a second fort at Hertford, which protected London from attack and encouraged many English living under Danish rule in Essex to submit to him. In 913 there was a pause in his activities, although Æthelflæd continued her fortress building in Mercia. In 914 a Viking army sailed from Brittany and ravaged the Severn estuary. It then attacked Ergyng in south-east Wales (now Archenfield in Herefordshire) and captured Bishop Cyfeilliog. Edward ransomed him for the large sum of forty pounds of silver. The Vikings were defeated by the armies of Hereford and Gloucester, and gave hostages and oaths to keep the peace. Edward kept an army on the south side of the estuary in case the Vikings broke their promises, and he twice had to repel attacks. In the autumn the Vikings moved on to Ireland. The episode suggests that south-east Wales fell within the West Saxon sphere of power, unlike Brycheiniog just to the north, where Mercia was dominant. In late 914 Edward built two forts at Buckingham, and Earl Thurketil, the leader of the Danish army at Bedford submitted to him. The following year he occupied Bedford, and constructed another fortification on the south bank of the River Great Ouse against a Viking one on the north bank. In 916 Edward returned to Essex and built a fort at Maldon to bolster the defence of Witham. He also helped Earl Thurketil and his followers to leave England, reducing the number of Viking armies in the Midlands. The decisive year in the war was 917. In April Edward built a fort at Towcester as a defence against the Danes of Northampton, and another at an unidentified place called Wigingamere. The Danes launched unsuccessful attacks on Towcester, Bedford and Wigingamere, while Æthelflæd captured Derby, showing the value of the English defensive measures, which were aided by disunity and a lack of coordination among the Viking armies. The Danes had built their own fortress at Tempsford in Bedfordshire, but at the end of the summer the English stormed it and killed the last Danish king of East Anglia. The English then took Colchester, although they did not try to hold it. The Danes retaliated by sending a large army to lay siege to Maldon, but the garrison held out until it was relieved and the retreating army was heavily defeated. Edward then returned to Towcester and reinforced its fort with a stone wall, and the Danes of nearby Northampton submitted to him. The armies of Cambridge and East Anglia also submitted, and by the end of the year the only Danish armies still holding out were those of four of the Five Boroughs, Leicester, Stamford, Nottingham, and Lincoln. In early 918, Æthelflæd secured the submission of Leicester without a fight, and the Danes of Northumbrian York offered her their allegiance, probably for protection against Norse (Norwegian) Vikings who had invaded Northumbria from Ireland, but she died on 12 June before she could take up the proposal. The same offer is not known to have been made to Edward, and the Norse Vikings took York in 919. According to the main West Saxon version of the Anglo-Saxon Chronicle, after Æthelflæd's death the Mercians submitted to Edward, but the Mercian version (the Mercian Register) states that in December 918 her daughter Ælfwynn "was deprived of all authority in Mercia and taken into Wessex". Mercia may have made a bid for continued semi-independence which was suppressed by Edward, and it then came under his direct rule. Stamford had surrendered to Edward before Æthelflæd's death, and Nottingham did the same shortly afterwards. According to the Anglo-Saxon Chronicle for 918, "all the people who had settled in Mercia, both Danish and English, submitted to him". This would mean that he ruled all England south of the Humber, but it is not clear whether Lincoln was an exception, as coins of Viking York in the early 920s were probably minted at Lincoln. Some Danish jarls were allowed to keep their estates, although Edward probably also rewarded his supporters with land, and some he kept in his own hands. Coin evidence suggests that his authority was stronger in the East Midlands than in East Anglia. Three Welsh kings, Hywel Dda, Clydog and Idwal Foel, who had previously been subject to Æthelflæd, now gave their allegiance to Edward. The principal currency in later Anglo-Saxon England was the silver penny, and some coins carried a stylised portrait of the king. Edward's coins had "EADVVEARD REX" on the obverse and the name of the moneyer on the reverse. The places of issue were not shown in his reign, but they were in that of his son Æthelstan, allowing the location of many moneyers of Edward's reign to be established. There were mints in Bath, Canterbury, Chester, Chichester, Derby, Exeter, Hereford, London, Oxford, Shaftesbury, Shrewsbury, Southampton, Stafford, Wallingford, Wareham, Winchester and probably other towns. No coins were struck in the name of Æthelred or Æthelflæd, but from around 910 mints in English Mercia produced coins with an unusual decorative design on the reverse. This ceased before 920, and probably represents Æthelflæd's way of distinguishing her coinage from that of her brother. There was also a minor issue of coins in the name of Plegmund, Archbishop of Canterbury. There was a dramatic increase in the number of moneyers over Edward's reign, fewer than 25 in the south in the first ten years rising to 67 in the last ten years, around 5 in English Mercia rising to 23, plus 27 in the conquered Danelaw. In 908, Plegmund conveyed the alms of the English king and people to the Pope, the first visit to Rome by an Archbishop of Canterbury for almost a century, and the journey may have been to seek papal approval for a proposed re-organisation of the West Saxon sees. When Edward came to the throne Wessex had two dioceses, Winchester, held by Denewulf, and Sherborne, held by Asser. In 908 Denewulf died and was replaced the following year by Frithestan; soon afterwards Winchester was divided into two sees, with the creation of the diocese of Ramsbury covering Wiltshire and Berkshire, while Winchester was left with Hampshire and Surrey. Forged charters date the division to 909, but this may not be correct. Asser died in the same year, and at some date between 909 and 918 Sherborne was divided into three sees, Crediton covering Devon and Cornwall, and Wells covering Somerset, leaving Sherborne with Dorset. The effect of the changes was to strengthen the status of Canterbury compared with Winchester and Sherborne, but the division may have been related to a change in the secular functions of West Saxon bishops, to become agents of royal government in shires rather than provinces, assisting in defence and taking part in shire courts. At the beginning of Edward's reign, his mother Ealhswith founded the abbey of St Mary for nuns, known as the Nunnaminster, in Winchester. Edward's daughter Eadburh became a nun there, and she was venerated as a saint and the subject of a hagiography by Osbert of Clare in the twelfth century. In 901, Edward started building a major religious community for men, possibly in accordance with his father's wishes. The monastery was next to Winchester Cathedral, which became known as the Old Minster while Edward's foundation was called the New Minster. It was much larger than the Old Minster, and was probably intended as a royal mausoleum. It acquired relics of the Breton Saint Judoc, which probably arrived in England from Ponthieu in 901, and the body of one of Alfred's closest advisers, Grimbald, who died in the same year and who was soon venerated as a saint. Edward's mother died in 902, and he buried her and Alfred there, moving his father's body from the Old Minster. Burials in the early 920s included Edward himself, his brother Æthelweard, and his son Ælfweard. On the other hand, when Æthelstan became king in 924, he did not show any favour to his father's foundation, probably because Winchester sided against him when the throne was disputed after Edward's death. The only other king buried at the New Minster was Eadwig in 959. Edward's method of endowing New Minster was of a piece with his ecclesiastical policy in general. Like his father he gave little to the church — indeed, judging by the dearth of charters for much of his reign he seems to have given away little at all...More than any other, Edward's kingship seems to epitomise the new hard-nosed monarchy of Wessex, determined to exploit all its resources, lay and ecclesiastical, for its own benefit. Patrick Wormald observes: "The thought occurs that neither Alfred nor Edward was greatly beloved at Winchester Cathedral; and one reason for Edward's moving his father's body into the new family shrine next door was that he was surer of sincere prayers there." The standard of Anglo-Saxon learning declined severely in the ninth century, particularly in Wessex, and Mercian scholars such as Plegmund played a major part in the revival of learning initiated by Alfred. Mercians were prominent at the courts of Alfred and Edward, and the Mercian dialect and scholarship commanded West Saxon respect. It is uncertain how far Alfred's programmes continued during his son's reign. English translations of works in Latin made during Alfred's reign continued to be copied, but few original works are known. The script known as Anglo-Saxon Square minuscule reached maturity in the 930s, and its earliest phases date to Edward's reign. The main scholarly and scriptorial centres were the cathedral centres of Canterbury, Winchester and Worcester; monasteries did not make a significant contribution until Æthelstan's reign. Very little survives of the manuscript production of Edward's reign. The only surviving large scale embroideries which were certainly made in Anglo-Saxon England date to Edward's reign. They are a stole, a maniple and a possible girdle removed from the coffin of St Cuthbert in Durham Cathedral in the nineteenth century. They were donated to the shrine by Æthelstan in 934, but inscriptions on the embroideries show that they were commissioned by Edward's second wife, Ælfflæd, as a gift to Frithestan, Bishop of Winchester. They probably did not reach their intended destination because Æthelstan was on bad terms with Winchester. Almost all surviving charters from Edward's reign are later copies, and the only surviving original is not a charter of Edward himself, but a grant by Æthelred and Æthelflæd in 901. In the same year a meeting at Southampton was attended by his brother and sons, his household thegns and nearly all bishops, but no ealdormen. It was on this occasion that the king acquired land from the Bishop of Winchester for the foundation of the New Minster, Winchester. No charters survive for the period from 910 to the king's death in 924, much to the puzzlement and distress of historians. Charters were usually issued when the king made grants of land, and it is possible that Edward followed a policy of retaining property which came into his hands to help finance his campaigns against the Vikings. Charters rarely survive unless they concerned property which passed to the church and were preserved in their archives, and another possibility is that Edward was only making grants of property on terms which ensured that they returned to male members of the royal house; such charters would not be found in church archives. Clause 3 of the law code called I Edward provides that people convincingly charged with perjury shall not be allowed to clear themselves by oath, but only by ordeal. This is the start of the continuous history in England of trial by ordeal; it is probably mentioned in the laws of King Ine (688 to 726),[b] but not in later codes such as those of Alfred. The administrative and legal system in Edward's reign may have depended extensively on written records, almost none of which survive. Edward was one of the few Anglo-Saxon kings to issue laws about bookland. There was increasing confusion in the period as to what was really bookland; Edward urged prompt settlement in bookland and folkland disputes, and his legislation established that jurisdiction belonged to the king and his officers. Then [Edward] went from there into the Peak District to Bakewell and ordered a borough to be built in the neighbourhood and manned. And then the king of the Scots and all the people of the Scots, and Rægnald and the sons of Eadwulf[c] and all who live in Northumbria, both English and Danish, Norsemen and others, and also the king of the Strathclyde Welsh and all the Strathclyde Welsh, chose him as father and lord. The idea that this meeting represented a 'submission', while it must remain a possibility, does however seem unlikely. The textual context of the chronicler's passage makes his interpretation of the meeting suspect, and ultimately, Edward was in no position to force the subordination of, or dictate terms to, his fellow kings in Britain. Edward continued Æthelflæd's policy of founding burhs in the north-west, at Thelwall and Manchester in 919, and Cledematha (Rhuddlan) at the mouth of the River Clwyd in North Wales in 921. Nothing is known of his relations with the Mercians between 919 and the last year of his life, when he put down a Mercian and Welsh revolt at Chester. Mercia and the eastern Danelaw were organised into shires at an unknown date in the tenth century, ignoring traditional boundaries, and historians such as Sean Miller and David Griffiths suggest that Edward's imposition of direct control from 919 is a likely context for a change which ignored Mercian sensibilities. Resentment at the changes, at the imposition of rule by distant Wessex, and at fiscal demands by Edward's reeves, may have provoked the revolt at Chester. He died at the royal estate of Farndon, twelve miles south of Chester, on 24 July 924, shortly after putting down the revolt, and was buried in the New Minster, Winchester. In 1109, the New Minster was moved outside the city walls to become Hyde Abbey, and the following year the remains of Edward and his parents were translated to the new church. According to William of Malmesbury, Edward was "much inferior to his father in the cultivation of letters", but "incomparably more glorious in the power of his rule". Other medieval chroniclers expressed similar views, and he was generally seen as inferior in book learning, but superior in military success. John of Worcester described him as "the most invincible King Edward the Elder". However, even as war leader he was only one of a succession of successful kings; his achievements were overshadowed because he did not have a famous victory like Alfred's at Edington and Æthelstan's at Brunanburh, and William qualified his praise of Edward by saying that "the chief prize of victory, in my judgment, is due to his father". 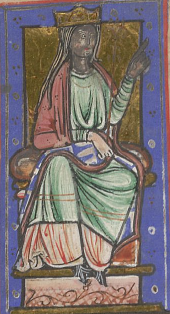 [d] Edward has also been overshadowed by chroniclers' admiration for his highly regarded sister, Æthelflæd. A principal reason for the neglect of Edward is that very few primary sources for his reign survive, whereas there are many for Alfred. He was largely ignored by historians until the late twentieth century, but he is now highly regarded. He is described by Keynes as "far more than the bellicose bit between Alfred and Æthelstan", and according to Nick Higham: "Edward the Elder is perhaps the most neglected of English kings. He ruled an expanding realm for twenty-five years and arguably did as much as any other individual to construct a single, south-centred, Anglo-Saxon kingdom, yet posthumously his achievements have been all but forgotten." In 1999 a conference on his reign was held at the University of Manchester, and the papers given on this occasion were published as a book in 2001. Prior to this conference, no monographs had been published on Edward's reign, whereas his father has been the subject of numerous biographies and other studies. Under Edward's leadership, the scale of alternative centres of power diminished markedly: the separate court of Mercia was dissolved; the Danish leaders were in large part brought to heel or expelled; the Welsh princes were constrained from aggression of the borders and even the West Saxon bishoprics divided. Late Anglo-Saxon England is often described as the most centralised polity in western Europe at the time, with its shires, its shire-reeves and its systems of regional courts and royal taxation. If so — and the matter remains debatable — much of that centrality derives from Edward's activities, and he has as good a claim as any other to be considered the architect of medieval England. Edward's cognomen 'the Elder' was first used in Wulfstan's Life of St Æthelwold at the end of the tenth century, to distinguish him from King Edward the Martyr. ^ The twelfth-century chronicler Ralph of Diceto stated that the coronation took place at Kingston, and this is accepted by Simon Keynes, although Sarah Foot says that "Edward might well have held the ceremony at Winchester". ^ It is not certain that the references in Ine's laws are to trial by ordeal. ^ Rægnald was the Norse Viking king of York in southern Northumbria, and Eadwulf was the Anglo-Saxon ruler of northern Northumbria, which was not conquered by the Vikings. ^ The order in which Edward's children are listed is based on the family tree in Foot's Æthelstan: the First King of England, which shows sons of each wife before daughters. The daughters are listed in their birth order according to William of Malmesbury's Gesta Regum Anglorum. The earliest primary sources do not distinguish whether Sihtric's wife was Æthelstan's full or half sister, and a tradition recorded at Bury in the early twelfth century makes her a daughter of Edward's second wife, Ælfflæd. She is described as the daughter of Edward and Ecgwynn in William of Malmesbury's twelfth century Deeds of the English Kings, and Michael Wood's argument that this is partly based on a lost early life of Æthelstan has been generally accepted. Modern historians follow William of Malmesbury's testimony in showing her as Æthelstan's full sister." William did not know her name, but some late sources name her as Edith or Eadgyth, an identification accepted by some historians. She is also identified in late sources with saint Edith of Polesworth, a view accepted by Alan Thacker, but dismissed as "dubious" by Sarah Foot, who thinks that it is likely that she entered the cloister in widowhood. ^ Keynes and Lapidge 1983, pp. 11–12. ^ Stenton 1971, pp. 245–57. ^ Yorke 2001, pp. 25–28. ^ Yorke 2001, pp. 25–26; Miller 2004. ^ Yorke 2001, pp. 25, 29–30. ^ Æthelhelm & PASE; S 356 & Sawyer; Yorke 2001, p. 31. ^ Keynes and Lapidge 1983, pp. 175–76, 321–22; Yorke 2001, p. 30. ^ Yorke 2001, pp. 31–35. ^ Yorke 2001, p. 32. ^ Yorke 2001, pp. 31–32. ^ Abels 1998, pp. 294–304. ^ Yorke 2001, p. 37. ^ Yorke 2001, pp. 33–34; Bailey 2001, p. 114; Mynors, Thomson and Winterbottom 1998, p. 199. ^ Keynes 1999, p. 467; Abels 1998, p. 307. ^ Yorke 2001, p. 33; Foot 2011, p. 31. ^ a b Yorke 2001, p. 33. ^ Nelson 1996, pp. 53–54, 63–66. ^ a b c d e Miller 2004. ^ Stenton 1971, p. 321; Lavelle 2009, pp. 53, 61. ^ Keynes 2001, p. 48; Foot 2011, p. 74, n. 46. ^ Stenton 1971, pp. 321–322; Hart 1992, pp. 512–15; Miller 2004. ^ Keynes 2001, pp. 44–58. ^ a b Ryan 2013, p. 298. ^ Stafford 2001, p. 45. ^ Insley 2009, p. 330. ^ Davidson 2001, pp. 203–05; Keynes 2001, p. 43. ^ Sharp 2001, pp. 81–86. ^ Abrams 2001, p. 136. ^ Stenton 1971, p. 323; Heighway 2001, p. 108. ^ Stenton 1971, p. 324, n. 1; Wainwright 1975, pp. 308–09; Bailey 2001, p. 113. ^ Miller 2004; Stenton 1971, pp. 324–25. ^ Charles-Edwards 2013, p. 506; Miller 2004. ^ Stenton 1971, pp. 325–26. ^ Miller 2004; Stenton 1971, pp. 327–29. ^ Miller 2004; Stenton 1971, pp. 329–31. ^ Abrams 2001, pp. 138–39; Lyon 2001, p. 74. ^ Charles-Edwards 2013, pp. 484, 498–500. ^ Lyon 2001, pp. 67–73, 77; Blackburn 2014. ^ Brooks 1984, pp. 210, 213. ^ Rumble 2001, pp. 230–31. ^ Yorke 2004b; Brooks 1984, pp. 212–13. ^ Rumble 2001, p. 243. ^ Rumble 2001, p. 231. ^ Thacker 2001, pp. 259–60. ^ Rumble 2001, pp. 231–34; Marafioti 2014, pp. 26–29. ^ Miller 2001, pp. xxv–xxix; Thacker 2001, pp. 253–54. ^ Rumble 2001, pp. 234–37, 244; Thacker 2001, p. 254. ^ Marafioti 2014, pp. 28–31. ^ Thacker 2001, p. 254. ^ Wormald 2001, pp. 274–75. ^ Gretsch 2001, p. 287. ^ Lapidge 1993, pp. 12–16. ^ Higham 2001a, p. 2. ^ Coatsworth 2001, pp. 292–96; Wilson 1984, p. 154. ^ Lapidge 1993, p. 13. ^ Keynes 2001, pp. 50–51, 55–56. ^ Wormald 2001, p. 275. ^ a b Campbell 2001, p. 14. ^ Campbell 2001, p. 23. ^ Wormald 2001, pp. 264, 276. ^ Davidson 2001, p. 205. ^ Davidson 2001, pp. 200–01. ^ Davidson 2001, p. 201. ^ Stenton 1971, p. 334. ^ Davidson 2001, pp. 206–07. ^ Smyth 1984, p. 199. ^ Stafford 1989, p. 33. ^ Davidson 2001, pp. 206, 209. ^ Griffiths 2001, p. 168. ^ Miller 2004; Griffiths 2001, pp. 167, 182–83. ^ Doubleday & Page 1903, pp. 116–22. ^ Higham 2001a, pp. 2–4; Keynes 2001, pp. 40–41. ^ Higham 2001a, pp. 3–9; Keynes 2001, p. 57. ^ Higham 2001a, pp. 1–4. ^ Wainwright 1975, p. 77. ^ Higham 2001b, p. 311. ^ a b c d Foot 2011, p. xv. ^ Thacker 2001, p. 257; Foot 2011, pp. 251–58. ^ Williams 1991, pp. xxix, 123; Foot 2011, p. xv; Miller 2004. ^ Miller 2004; Williams 1991, pp. xxix, 123. ^ Thacker 2001, pp. 257–58; Foot 2011, p. 48; Foot 2010, p. 243. ^ Foot 2011, p. 11. ^ Thacker 2001, pp. 257–58. ^ Foot 2011, p. 17. ^ Foot 2011, p. 21. ^ a b Foot 2011, p. 45. ^ Foot 2011, p. 46; Stafford 2011. ^ Foot 2011, p. 18. ^ Foot 2011, p. 51. ^ Yorke 2004a; Thacker 2001, pp. 259–60. ^ Foot 2011, pp. 50–51; Stafford 2004. Abels, Richard (1998). Alfred the Great: War, Kingship and Culture in Anglo-Saxon England. Harlow, UK: Longman. ISBN 978-0-582-04047-2. Abrams, Lesley (2001). "Edward the Elder's Danelaw". In Higham, Nick; Hill, David. Edward the Elder 899–924. Abingdon, UK: Routledge. pp. 128–43. ISBN 978-0-415-21497-1. "Æthelhelm 4 (Male)". Prosopography of Anglo-Saxon England (PASE). Retrieved 31 December 2016. Bailey, Maggie (2001). "Ælfwynn, Second Lady of the Mercians". In Higham, Nick; Hill, David. Edward the Elder 899–924. Abingdon, UK: Routledge. pp. 112–27. ISBN 978-0-415-21497-1. Blackburn, M. A. S. (2014). "Coinage". In Lapidge, Michael; Blair, John; Keynes, Simon; Scragg, Donald. The Wiley Blackwell Encyclopaedia of Anglo-Saxon England (2nd ed.). Chichester, UK: Wiley– Blackwell. pp. 114–15. ISBN 978-0-631-22492-1. Brooks, Nicholas (1984). The Early History of the Church of Canterbury. Leicester, UK: Leicester University Press. ISBN 978-0-7185-1182-1. Campbell, James (2001). "What is not Known About the Reign of Edward the Elder". In Higham, Nick; Hill, David. Edward the Elder 899–924. Abingdon, UK: Routledge. pp. 12–24. ISBN 978-0-415-21497-1. Charles-Edwards, T. M. (2013). Wales and the Britons 350–1064. Oxford, UK: Oxford University Press. ISBN 978-0-19-821731-2. Coatsworth, Elizabeth (2001). "The Embroideries from the Tomb of St Cuthbert". In Higham, Nick; Hill, David. Edward the Elder 899–924. Abingdon, UK: Routledge. pp. 292–306. ISBN 978-0-415-21497-1. Davidson, Michael R. (2001). "The (Non)submission of the Northern Kings in 920". In Higham, N. J.; Hill, D. H. Edward the Elder, 899–924. Abingdon, UK: Routledge. pp. 200–11. ISBN 978-0-415-21497-1. Doubleday, Arthur; Page, William, eds. (1903). "New Minster, or the Abbey of Hyde". A History of the County of Hampshire. Victoria County History. 2. London, UK: Constable. pp. 116–22. OCLC 832215096. Foot, Sarah (2010). "Dynastic Strategies: The West Saxon Royal Family in Europe". In Rollason, David; Leyser, Conrad; Williams, Hannah. England and the Continent in the Tenth Century: Studies in Honour of Wilhelm Levison (1876–1947). Turnhout, Belgium: Brepols. pp. 237–53. ISBN 978-2-503-53208-0. Foot, Sarah (2011). Æthelstan: the First King of England. New Haven, Connecticut: Yale University Press. ISBN 978-0-300-12535-1. Gretsch, Mechtild (2001). "The Junius Psalter Gloss: Tradition and Innovation". In Higham, Nick; Hill, David. Edward the Elder 899–924. Abingdon, UK: Routledge. pp. 280–91. ISBN 978-0-415-21497-1. Griffiths, David (2001). "The North-West Frontier". In Higham, Nick; Hill, David. Edward the Elder 899–924. Abingdon, UK: Routledge. pp. 167–87. ISBN 978-0-415-21497-1. Hart, Cyril (1992). The Danelaw. London, UK: The Hambledon Press. ISBN 978-1-85285-044-9. Heighway, Carolyn (2001). "Gloucester and the New Minster of St Oswald". In Higham, Nick; Hill, David. Edward the Elder 899–924. Abingdon, UK: Routledge. pp. 102–11. ISBN 978-0-415-21497-1. Higham, Nick (2001a). "Edward the Elder's Reputation: An Introduction". In Higham, N. J.; Hill, D. H. Edward the Elder, 899–924. Abingdon, UK: Routledge. pp. 1–11. ISBN 978-0-415-21497-1. Higham, Nick (2001b). "Endpiece". In Higham, N. J.; Hill, D. H. Edward the Elder, 899–924. Abingdon, UK: Routledge. pp. 307–11. ISBN 978-0-415-21497-1. Insley, Charles (2009). "Southumbria". In Stafford, Pauline. A Companion to the Early Middle Ages: Britain and Ireland c.500- c.1100. Chichester, UK: Wiley-Blackwell. pp. 322–40. ISBN 978-1-118-42513-8. Keynes, Simon (1999). "England, c.900–1016". In Reuter, Timothy. The New Cambridge Medieval History. III. Cambridge, UK: Cambridge University Press. pp. 456–84. ISBN 978-0-521-36447-8. Keynes, Simon (2001). "Edward, King of the Anglo-Saxons". In Higham, N. J.; Hill, D. H. Edward the Elder, 899–924. Abingdon, UK: Routledge. pp. 40–66. ISBN 978-0-415-21497-1. Keynes, Simon; Lapidge, Michael, eds. (1983). Alfred the Great: Asser's Life of King Alfred & Other Contemporary Sources. London, UK: Penguin Classics. ISBN 978-0-14-044409-4. Lapidge, Michael (1993). Anglo-Latin Literature 900–1066. London, UK: The Hambledon Press. ISBN 978-1-85285-012-8. Lavelle, Ryan (2009). "The Politics of Rebellion: The Ætheling Æthelwold and the West Saxon Royal Succession, 899–902". In Skinner, Patricia. Challenging the Boundaries of Medieval History: The Legacy of Timothy Reuter. Turnhout, Belgium: Brepols. pp. 51–80. ISBN 978-2-503-52359-0. Lyon, Stewart (2001). "The coinage of Edward the Elder". In Higham, N. J.; Hill, D. H. Edward the Elder, 899–924. Abingdon, UK: Routledge. pp. 67–78. ISBN 978-0-415-21497-1. Marafioti, Nicole (2014). The King's Body: Burial and Succession in Late Anglo-Saxon England. Toronto, Canada: University of Toronto Press. ISBN 978-1-4426-4758-9. Miller, Sean (2001). "Introduction: The History of the New Minster, Winchester". In Miller, Sean. Charters of the New Minster, Winchester. Oxford, UK: Oxford University Press for The British Academy. pp. xxv–xxxvi. ISBN 978-0-19-726223-8. Mynors, R. A. B.; Thomson, R.M; Winterbottom, M., eds. (1998). William of Malmesbury: The History of the English Kings. Oxford, UK: Clarendon Press. ISBN 978-0-19-820678-1. Nelson, Janet (1996). "Reconstructing a Royal Family: Reflections on Alfred from Asser, Chapter 2". In Wood, Ian; Lund, Niels. People and places in Northern Europe 500-1600 : Essays in Honour of Peter Hayes Sawyer. Woodbridge, UK: Boydell Press. pp. 48–66. ISBN 978-0-851-15547-0. Rumble, Alexander R. (2001). "Edward and the Churches of Winchester and Wessex". In Higham, Nick; Hill, David. Edward the Elder 899–924. Abingdon, UK: Routledge. pp. 230–47. ISBN 978-0-415-21497-1. Ryan, Martin J. (2013). "Conquest, Reform and the Making of England". In Higham, Nicholas J.; Ryan, Martin J. The Anglo-Saxon World. New Haven, Connecticut: Yale University Press. pp. 284–322. ISBN 978-0-300-12534-4. "S 356". The Electronic Sawyer: Online Catalogue of Anglo-Saxon Charters. Retrieved 18 December 2017. Sharp, Sheila (2001). "The West Saxon Tradition of Dynastic Marriage, with Special Reference to the Family of Edward the Elder". In Higham, Nick; Hill, David. Edward the Elder 899–924. Abingdon, UK: Routledge. pp. 79–88. ISBN 978-0-415-21497-1. Smyth, Alfred P (1984). Warlords and Holy Men: Scotland AD 80–1000. London, UK: Edward Arnold. ISBN 978-0-7131-6305-6. Stafford, Pauline (1989). Unification and Conquest: A Political and Social History of England in the Tenth and Eleventh Centuries. London, UK: Edward Arnold. ISBN 978-0-7131-6532-6. Stafford, Pauline (2001). "Political Women in Mercia, Eighth to Early Tenth Centuries". In Brown, Michelle P.; Farr, Carol A. Mercia: An Anglo-Saxon Kingdom in Europe. London, UK: Leicester University Press. pp. 35–49. ISBN 978-0-7185-0231-7. Stenton, Frank (1971). Anglo-Saxon England (3rd ed.). Oxford, UK: Oxford University Press. ISBN 978-0-19-280139-5. Thacker, Alan (2001). "Dynastic Monasteries and Family Cults". In Higham, Nick; Hill, David. Edward the Elder 899–924. Abingdon, UK: Routledge. pp. 248–63. ISBN 978-0-415-21497-1. Wainwright, F. T. (1975). Scandinavian England: Collected Papers. Chichester, UK: Phillimore. ISBN 978-0-900592-65-2. Williams, Ann (1982). "Princeps Merciorum Gentis: the Family, Career and Connections of Ælfhere, Ealdorman of Mercia 956-983". Anglo-Saxon England. Cambridge, UK: Cambridge University Press. 10: 143–72. doi:10.1017/s0263675100003240. ISBN 978-0-521-24177-9. Williams, Ann; Smyth, Alfred P.; Kirby, D. P. (1991). A Biographical Dictionary of Dark Age Britain: England, Scotland, and Wales. London, UK: Seaby. ISBN 978-1-85264-047-7. Wilson, David (1984). Anglo-Saxon Art from the Seventh Century to the Norman Conquest. London, UK: Thames and Hudson. ISBN 978-0-500-23392-4. Wormald, Patrick (2001). "Kingship and Royal Property from Æthelwulf to Edward the Elder". In Higham, Nick; Hill, David. Edward the Elder 899–924. Abingdon, UK: Routledge. pp. 264–79. ISBN 978-0-415-21497-1. Yorke, Barbara (2001). "Edward as Ætheling". In Higham, Nick; Hill, David. Edward the Elder 899–924. Abingdon, UK: Routledge. pp. 25–39. ISBN 978-0-415-21497-1. Wikimedia Commons has media related to Edward the Elder. Æthelred I was King of Wessex from 865 to 871. He was the fourth son of King Æthelwulf of Wessex. He succeeded his brother, Æthelberht (Ethelbert), as King of Wessex and Kent in 865. Æthelflæd, Lady of the Mercians ruled Mercia in the English Midlands from 911 until her death. She was the eldest daughter of Alfred the Great, king of the Anglo-Saxon kingdom of Wessex, and his wife Ealhswith. Æthelflæd was born around 870 at the height of the Viking invasions of England. By 878, most of England was under Danish Viking rule – East Anglia and Northumbria having been conquered, and Mercia partitioned between the English and the Vikings – but in that year Alfred won a crucial victory at the Battle of Edington. Soon afterwards the English-controlled western half of Mercia came under the rule of Æthelred, Lord of the Mercians, who accepted Alfred's overlordship. Alfred adopted the title King of the English, claiming to rule all English people not living in areas under Viking control. In the mid-880s, Alfred sealed the strategic alliance between the surviving English kingdoms by marrying Æthelflæd to Æthelred. Æthelstan or Athelstan was King of the Anglo-Saxons from 924 to 927 and King of the English from 927 to 939 when he died. He was the son of King Edward the Elder and his first wife, Ecgwynn. Modern historians regard him as the first King of England and one of the greatest Anglo-Saxon kings. He never married and had no children. He was succeeded by his half-brother, Edmund. 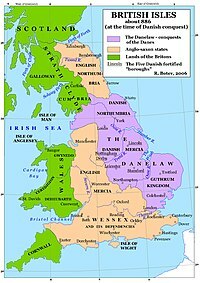 The Danelaw, as recorded in the Anglo-Saxon Chronicle, is a historical name given to the part of England in which the laws of the Danes held sway and dominated those of the Anglo-Saxons. Danelaw contrasts with West Saxon law and Mercian law. The term is first recorded in the early 11th century as Dena lage. Modern historians have extended the term to a geographical designation. The areas that constituted the Danelaw lie in northern and eastern England. Ealhswith or Ealswitha was the wife of King Alfred the Great. Her father was a Mercian nobleman, Æthelred Mucel, Ealdorman of the Gaini, which is thought to be an old Mercian tribal group. Her mother was Eadburh, a member of the Mercian royal family, and according to the historian Cyril Hart she was a descendant of King Coenwulf of Mercia. She is commemorated as a saint in the Christian East and the West on 20 July. Æthelwold or Æthelwald was the younger of two known sons of Æthelred I, King of Wessex from 865 to 871. Æthelwold and his brother Æthelhelm were still infants when their father the king died while fighting a Danish Viking invasion. The throne passed to the king's younger brother Alfred the Great, who carried on the war against the Vikings and won a crucial victory at the Battle of Edington in 878. Æthelhelm or Æþelhelm was the elder of two known sons of Æthelred I, King of Wessex from 865 to 871. Ecgwynn or Ecgwynna, was the first consort of Edward the Elder, later King of the English, by whom she bore the future King Æthelstan, and a daughter who married Sihtric Cáech, Norse king of Dublin, Ireland, and Northumbria. Extremely little is known about her background and life. Not even her name is given in any sources until after the Norman Conquest. The first to record it is William of Malmesbury, who presents it in Latinised guise as Egwinna and who is in fact the principal source for her existence. St Oswald's Priory was founded by Æthelflæd, daughter of Alfred the Great, and her husband Æthelred, ealdorman of Mercia, in the late 880s or the 890s.